First clergymen in Russian Army after the Bolshevik revolution. For the first time in the history of modern Russian Army Forces a training for priests and military officials has been organized. The event takes place in the southern city of Rostov-on-Don and it is attended by army chaplains, who have already started working with troops, and by military officials of the Department for relationship with religious soldiers. The main issue of the meeting is to collect requirements and recommendations for dealing with religious people in the Army. On July 21, 2009 President Dmitry Medvedev supported the initiative of the leaders of the major Russian religious communities to recreate the institution of military clergy abolished in 1918. 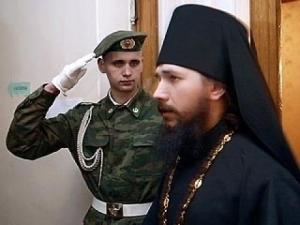 According to the following approved program in the Russian Army there will be 240 staff positions of priests and nine civilian positions to coordinate chaplains’ activity. Since the beginning of 2011 the Black Sea Fleet and the Russian military bases in the republics of Abkhazia, South Ossetia and Armenia have their own religious personnel. Auto sonnenschutz für kinder: sonnenschutz kinder auto laitovo.de.